Evette joined the team as a Patient Access Representative in May of 2015. She has worked as a Front Desk/Reservation Agent at The Roberts House and Nantucket Island Resorts, she also worked in Park City, Utah in the winter at Stein Erikson Lodge, St. Regis and the Westgate Resorts and Spa. She has been working in the hospitality industry for the past 14 years. Evette has served as an Administrative Assistant, Spa Supervisor, Property Supervisor/Innkeeper, Concierge Agent and Night Auditor. 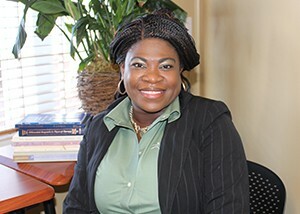 Evette received her Associate’s Degree in Business Management from Montego Bay Jamaica. She has recently been accepted to Southern New Hampshire University where she will be pursuing her Bachelor’s of Science Degree, with a concentration in Customer Service and Public Relations. She has been visiting Nantucket since 2000 and moved to the island in 2012.